DRMS IS PLEASED TO ANNOUNCE the new Mississippi Resource Database. 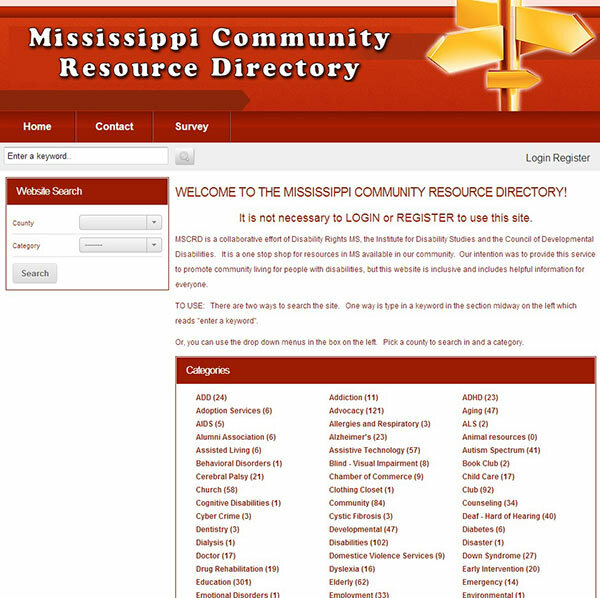 The Mississippi Community Resource Database (MSCRD) is a collaborative effort of Disability Rights MS, the Institute for Disability Studies and the Council of Developmental Disabilities. It is a one stop shop for resources in MS available in our community. Our intention is to provide this service to promote community living for people with disabilities, but this website is inclusive and includes helpful information for everyone. Please, check it out at mscrd.org and give us your feedback. If you would like us to introduce it to your agency, call Cindy Singletary at 228-341-3449 to schedule a personal tour of the website.